The Dog has been a bit picky with her food lately, so Staff picked up a few random cans at the pet store in hopes of enticing her. 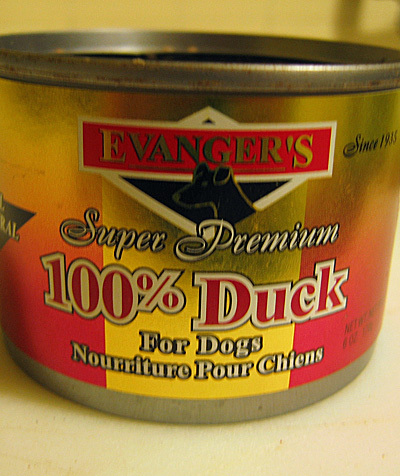 Experimental Dog Food #1, “100% Duck”, was a hit with The Dog. 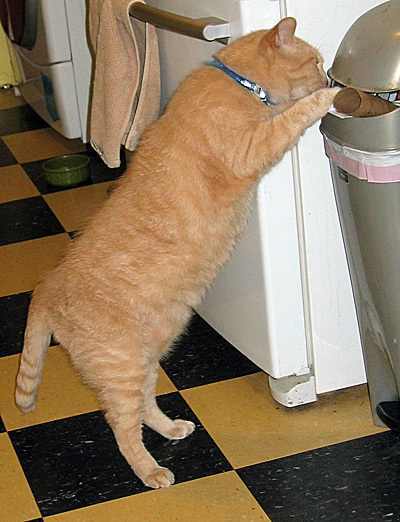 It was also a hit with Jeff, who sniffed through the kitchen like a bloodhound until he located the empty 100% Duck can in the recycle bin. The 100% Duck can was pushed about the kitchen as Jeff extracted all remaining bits. Staff looks forward to Experimental Dog Food #2, “100% Rabbit”. What, no Hoisin sauce? Jeff should be outraged! 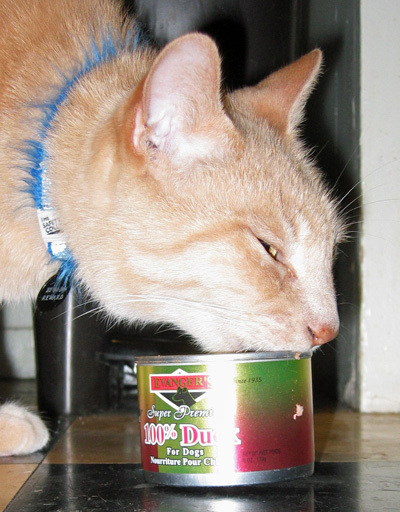 Jeff, be careful licking out of the can … edges can be sharp. So…..Hazel gets premium dog food and JEFF got baby food. Question, Staff …. thought you are there to serve JEFF? Hazel is special, however you serve JEFF!!!! He needs his own cans of dog food. Check out the video for a cameo by Norman. 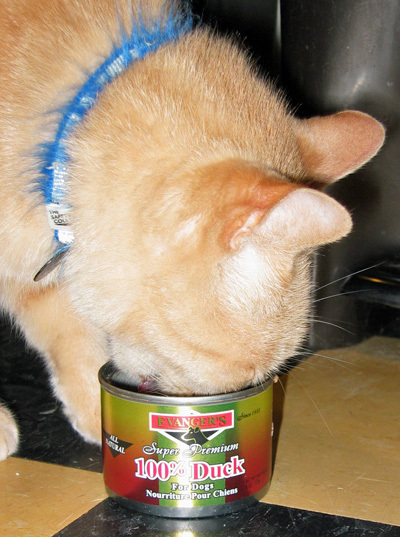 And it is true that cats like duck meat. My mother’s cats always clear out their dishes when given duck meat or duck cat food. And as for the rabbit, Jeff can be expected to lend an experienced palette to its tasting. He has dined on rabbit more than once, after all. El Jefe obviously cannot be bothered while enjoying some premium duck, wondering if Normie displayed any interest? He just seemed to wander on through to see what was going on, although he probably knows better than to interfere with Jeff’s eating! Staff’s pet food bill just went up at least 30%. Jeff DEMANDS more experimental dog food! Why is there French on the can? You live in California, not Canada!